Hey everyone! Along with the Nerdy 30 posts that you have seen this season, another feature that you will see repeatedly this hockey season is a monthly Hipster Pickings post. The first of these came the night of the 2014 NHL entry draft and the purpose of these posts is to find the hidden gems of NHL talent; hence the phrase “I knew him before he was cool” at the start of every title. Today, we take a look to find who has been the most analytically talented rookie at the quarter-point of the NHL season. Of the 66 that have put on an NHL sweater for the first time this year, only 17 have played 19 games or more (or roughly 75% of what an average NHL team has played so far this season) as of last Saturday. 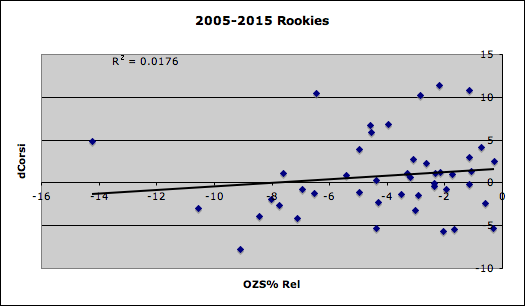 The running stereotype amongst rookies is that even if they rack up goals and points, it is all because they are given favorable zone starts and poor quality of competition by their coaches. If anything, it is a smart strategy by a coach because it will allow rookies to get acclimated into the NHL level of play and eventually, give them tougher minutes in the long run. Take my favorite team’s rookie sensation: Andre Burakovsky. As of December 1st, “The Burracuda” has recorded 4 goals and 9 assists in 26 games, but he is performing well offensively because of his relative offensive zone start percentage (offensive zone start percentage in relation to his teammates) of +16.28%. That is the 19th highest out of the 392 NHL forwards that have played at lease 100 even strength minutes so far this season. Now that actually doesn’t seem terrible on the surface when you see players like Zach Parise, Max Pacioretty and James Neal within the vicinity of Burakovsky’s deployment. That being said, guess who’s the most sheltered debutant from a relative zone starts standpoint. That would be Leon Drasaitl who is sitting at a whopping +35.12% and that just so happens to lead all NHL forwards. To only see him at a +4.00% relative fenwick percentage (percentage of unblocked shots on and off target in relation to his teammates) and only record 6 points in 26 games is not good so far. Three years have passed and I am still in awe of Sean Couturier’s rookie season (2011-2012 season). It didn’t even matter that he was a top-10 pick robbed of a top-three selection because of concussion fears and was drafted to the perfect situation in the Philadelphia Flyers. Since his first ever game, Couturier was their team’s most dependable penalty killer. His relative zone start percentage of -14.06% was good enough for 19th lowest out of 299 NHL forwards that played 600 even strength minutes that year. Even better, among those that were given tougher zone starts, only David Steckel, Brian Boyle and Marcel Goc bettered Couturier’s relative fenwick percentage of -0.42%. Oh, and his opening day age that season was 18 years and 110 days old. So forget the goal scorers! I want someone that has been given tough assignments and conquered them like no one’s business. Only one player has been able to perform well under such difficult assignments and he’s a defenseman who happens to look like Patrick Wilson with Seth Green’s haircut. That would be New Jersey Devil Damon Severson. So far this season, he has recorded a relative zone start percentage of -7.61% and produced a relative fenwick percentage of +1.08%. Of the 196 defensemen that have played 165 even strength minutes, Severson has the 30th lowest relative offensive zone start percentage. While pulling this off, Severson has recorded 10 points in 27 games and is 78th out of those 196 defensemen in relative fenwick percentage. Now let’s talk about dCorsi (or delta-Corsi). This is a relatively new number created by Stephen Burtch that hopes to eliminate as many biases as possible that relative corsi could create. Some will argue that relative corsi could be inflated or worsened as a result of the teammates around them. dCorsi is there to create a number that factors anything that can affect puck possession; including how coaches implement their systems or players usage and how players play on particular teams. Here are three articles that Burtch wrote explaining dCorsi that I highly recommend you read. With that in mind, there are two ways of reading Severson’s delta Corsi. One is on a per 60 minute basis and another is an overall total, which is known as “dCorsi impact”. So far, Severson’s dCorsi per 60 minutes is +1.08%, good for 82nd out of the same 196 d-men. His dCorsi impact is +7.54, good for 59th out of the 196. Even if the relationship between dCorsi and challenging relative offensive zone starts is minimal, the data shows that the tougher the zone starts, the harder it is to generate a strong dCorsi per 60. 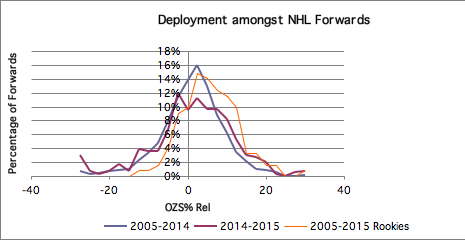 While dCorsi Impact is a fascinating new stat, it actually has less of a relationship with hockey’s latest deployment numbers than dCorsi does. Speaking of deployment, let’s talk about quality of competition. In this section, I will be passing out two numbers for each player: QoC (Quality of Competition) Corsi percentage (how good are a player’s opponents in puck possession) and QoC Time On Ice percentage (what percentage of minutes are the player’s opponents getting). 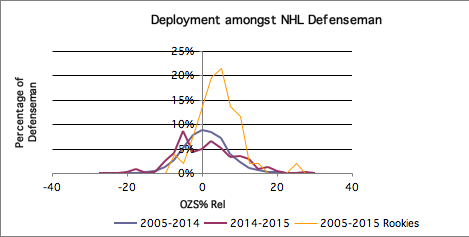 While QoC Time On Ice% has been a common statistic used in the hockey analytics community, we don’t know if that number means a player is facing good or bad opponents, no matter how many minutes they play. The opposite can be true about QoC Corsi% because what if all the player’s best opponents happen to be fourth line forwards and bottom pairing defenseman instead of top line forwards and defenseman. Since we know each number brings different meanings but additional context, both will be presented. While Sean Couturier was the standard bearer for rookie forwards being deployed in the toughest situations, his QoC Time On Ice percentage was only 28.17%: good for 213th out of the 299 forwards that played 600 even strength minutes. 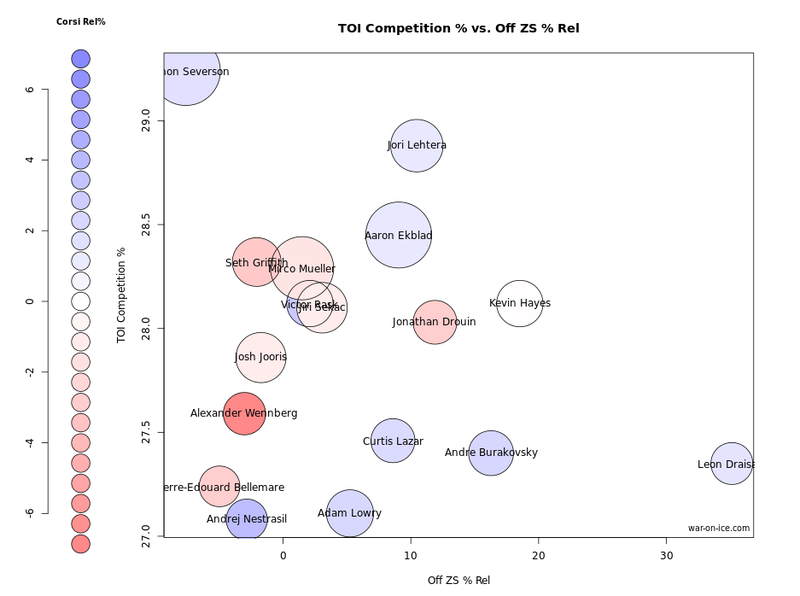 That being said, those opponents also generated a corsi of 50.93%: good for 70th out of those same 299 forwards. As for Severson, his QoC Time on Ice Percentage is a whopping 29.24%, good for 28th out of 196 defenseman with over 165 even strength minutes so far this season and his 51.70% QoC Corsi percentage ranks him 21st out of that same group. Even if he is partnered with Andy Greene as New Jersey’s top pairing on the blue line from the beginning, those are incredible delpoyment numbers for someone that young and with that little of pedigree coming into this season. Let’s also not forget that this is New Jersey we are talking here; where Scott Neidermeyer, Ken Daneyko and Scott Stevens used to patrol the blue line for many years at the Garden State. If your looking for false narratives, I guess feeling the pressure of living up to those names and maintaining the playing style of stifling defense for a 20-year old no-name has to be immense. It’s been a long road for Severson to get to where he is. His major Canadian junior career started out with little expections after being drafted in the ninth round (192nd overall) in the WHL Bantam Draft by the Kelowna Rockets. But like his situation with New Jersey, Severson could not find a better place to develop his skills as Kelowna has a reputation of developing world class defenseman over their history. Famous alumni over the years have included Alexander Edler, Josh Gorges, Duncan Keith, Scott Hannan, Tyler Myers, Luke Schenn, Tyson Barrie, Shea Weber and Sheldon Souray. I think we can all agree that that is not a bad list. 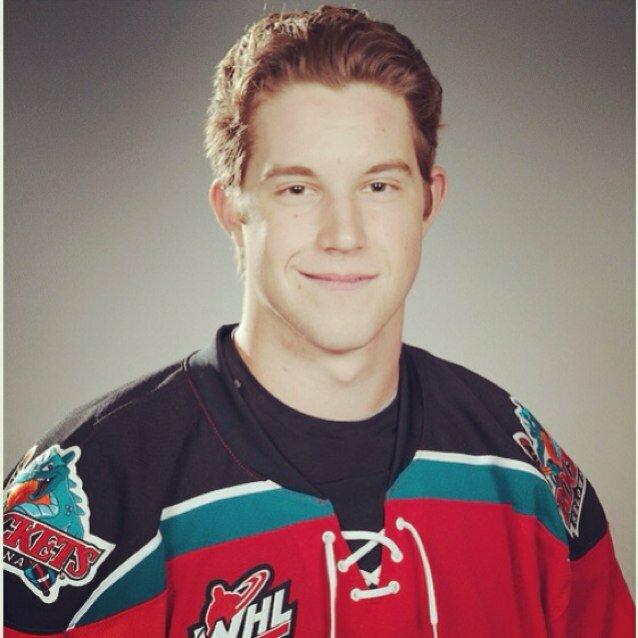 After having to play only five games with Kelowna and the majority of the season with the AAA Midget Yorktown Harvest at age-15, Severson would go on to become a regular for the Rockets and would play for Canada at the World Under-17 Challenge at 16 and then at the World Under-18 Championships at 17. Even if being drafted at the end of the second round in the 2012 entry draft by New Jersey was a great accomplishment for Severson, it was an area of the draft where the amount of certainty to have a sustainable career would start decreasing significantly. He was considered a defenseman that did everything well, but nothing great. Some argued he needed to work on his conditioning despite missing six weeks to an injured wrist at the tail end of his draft year. Some also argued that he lacked offensive upside despite having a booming shot from the point. Whatever the criticism, Severson would go from putting up 54 points in 125 games in his first three seasons with Kelowna to 113 points in 135 games and a gigantic +90 in his last two seasons, including a 2-game stint with AHL Albany (since there is little to no CHL analytics, let’s assume plus/minus is a big deal for only one time). Within a few months, he joined the big club and has impressed ever since. The Devils need a guy like Severson to develop into a core piece in the long term, especially if they ever want to avoid continually becoming one of the oldest teams in NHL history.